Affiliate marketing isn’t some groundbreaking new marketing tactic. In fact, for years companies and retailers have worked with online publishers to gain referral business. And just as blogger & influencer marketing efforts increase year after year, we’ve seen a rise in online voices hoping to monetize their channels as well. The term “affiliate marketing” has typically been used in an online context, with the advent of the Internet drastically changing how people find product and service information. The Web immediately became a lucrative element of brand marketing with the rise of ecommerce and blogging quickly thereafter. It’s been said that the first affiliate marketing program was setup by PC Flowers & Gifts back in 1989. After that in 1996, Amazon launched its, then called, “Associates Program” that has since been the model for many other companies looking to create similar programming. What made the affiliate marketing model even more widespread was the introduction of the affiliate networks we’re familiar with today. In 1998, Commission Junction and Clickbank began offering affiliate opportunities for smaller retailers hoping to join the game. Since then, affiliate marketing efforts have only increased and with legislation like FTC disclosure guidelines and Affiliate Nexus Tax solidifying this strategy. 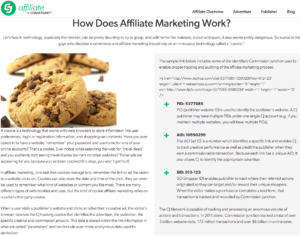 For retailers and businesses, affiliate network services typically provide value in several ways; they offer a menu of publishers to partner with and manage the tracking, reporting, and payment of their programs. For affiliates and influencers, these networks offer opportunities to monetize their blogs and provide their audiences with information around products and services they love. 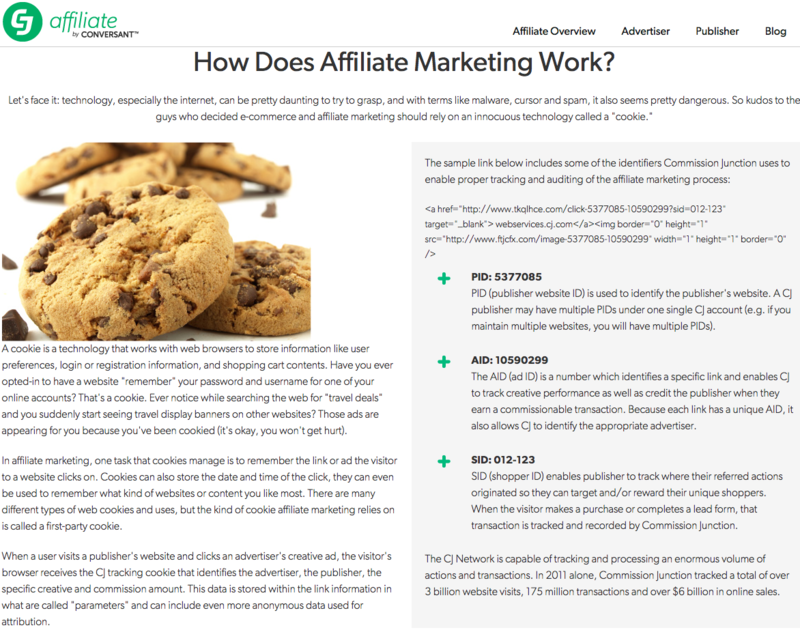 The tracking of affiliate marketing efforts relies on technology called a “cookie.” A cookie interacts with web browsers to store various user information and online preferences. In this case, cookies are able to remember what specific links website visitors click on and provide detailed information around a website visitors behavior. There are two compensation models commonly used to pay affiliate publishers their commission: Cost Per Action (CPA) and Cost Per Sale (CPS). Cost-Per-Action (CPA): Compensation is based on specified actions being taken by the referral or lead such as clicking a specific link on a blog post or registering for a sales demo. Cost-Per-Sale (CPS): Compensation is based on a set commission value paid only when the affiliate publisher refers a lead that results in a formal sale. Commission percentages with the Cost-Per-Action model tend to be smaller since it doesn’t necessarily generate direct sales while the Cost-Per-Sale model tends to include higher affiliate payouts. So, Who’s Powering These Awesome Affiliate Programs? New affiliate networks are popping up all the time, but the originals certainly remain and grow each day too. Below are a few of the main players helping merchants identify and partner with the right affiliating publishers. CJ Affiliate by Conversant (Formally Commission Junction) is one of the oldest and most successful networks. In 2011 alone, CJ tracked 3 billion website visits, 175 million transactions and over $6 billion in online sales. Rakuten Rakuten.com has an affiliate program where they have publishers just like any other merchant. But Rakuten Affiliate Network is where people can monetize their blog. ClickBank– Founded back in 1999, ClickBank is one of the premier online retailers with a library of over 6 million unique products that reach 200 million customers around the world.